In addition to the large animals, the Ranch enjoys a wealth of small ones, including the coyote, fox, rabbits, and many other species. DESCRIPTION: Gray or red-gray with buff underparts; long, tawny legs with a dark vertical line on lower foreleg; bushy tail with black tip. Nose pad to 1” wide. Ears prominent. Height at shoulder 23-26”. HABITAT: Open meadows. Establishes den on well-drained slopes. FYI: Young are born in April and May. The best runner among its species, the coyote can leap 14’ and runs normally at 25 to 30 mph. A strong swimmer, it won’t hesitate to enter the water after its prey. Best heard at dawn, dusk or during the night. Listen for a series of barks and yelps followed by short, prolonged howl and ending with short, sharp yaps. Coyote will eat rabbits, mice, ground squirrels, pocket gophers and other small mammals, birds, frogs, toads, snakes, insects and many kinds of fruit. Man is the major enemy. DESCRIPTION: Reddish on back and face, white underparts including throat. Tail bushy and white-tipped; feet and legs black. Prominent ears. Height at shoulder 14 to 15”. Weight to 13 lbs. HABITAT: Woody and brushy areas. Favored den sites are small caves, rock piles, hollow logs and hollow trees, especially oaks. FYI: Young are usually born in March or April and hunting for themselves at four months. Red foxes are not always red, some are black with silver guard hairs; others are red or brown. Most often seen during the winter months on the Ranch. The fox is sometimes seen foraging by day in brush, thick forest or timber; however, it is a nocturnal animal. Best time for viewing is early morning and late afternoon. Omnivorous, it feeds on cottontail rabbits, mice and other small mammals, birds, insects, and plant material. Predators are most often domestic and wild dogs. DESCRIPTION: Grayish brown above; white below with black-tipped ears that are long and densely furred inside. Length averages 13" to 15”, weight to 36 oz. HABITAT: Sagebrush and wooded areas throughout the Ranch. FYI: Active from early evening to late morning. This rabbit usually uses burrows and rocky crevices for shelter. Feeds on green grass in summer; barks and twigs in winter. Breeding runs from February to July. DESCRIPTION: A large-footed hare that turns white in winter; in summer dark brown. Moderately long ears (to 3⅛”) that are tipped black. Large, long hindfeet. Eyes orange. The hare can weigh up to 3⅛ lbs. and be as long as 20½”. HABITAT: Forest areas throughout the Ranch. FYI: A small and shy hare, it is usually nocturnal. It can bound as far as 12 feet in a single leap and run up to 30 mph. 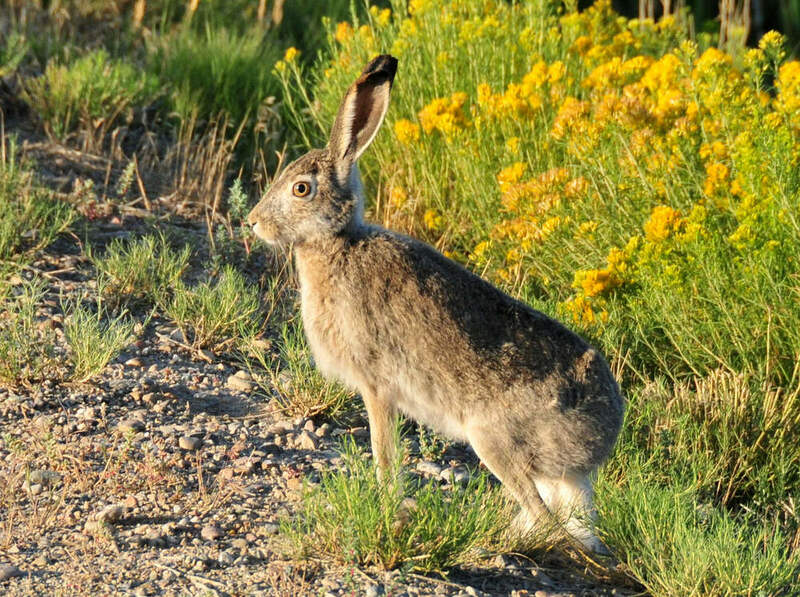 Like a cottontail, it often tries to hide in the brush, instead of running into the open like other hares. Though a good swimmer, it avoids water. During the summer, it eats grasses, green vegetation, willow and berries. During the winter, it dines on conifer buds and bark of aspen, alder and willow. Its predators include weasels, foxes, mink, owls, hawks and bobcat. These hare are difficult to spot because their coats camouflage them into the surroundings. DESCRIPTION: Brownish gray in summer, turning white or pale gray in winter. Long ears run to 4⅜”. Tail almost always white above and below. Weighs up to 9½ lbs. HABITAT: Meadows and scrub areas facing west and north. FYI: Sits in its lair during the day. Appears at night to feed on grasses and other vegetation. In the winter may also eat buds, bark and small twigs. Has been clocked at 40 mph and can clear 17 feet at a jump.